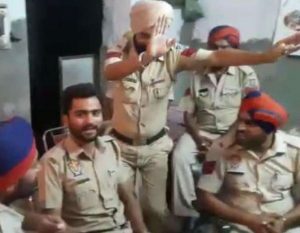 A video clip has surfaced that shows a few cops boozing inside the police station in Punjab’s Anandpur Sahib. The policemen are seen clapping and one even stood up to dance during the liquor party. After the video surfaced, officials said action would be taken against the cops, though nothing has been done so far. Liquor is not even sold in the holy city of Anandpur Sahib. The video clearly exposes the law and order situation in Punjab.